I never thought I would see the day when I went back to wearing lip liners, but here we are. Almost any and every look I did in my early 20's consisted of a lined lip - sometimes I would even line my lips with a darker liner and fade into a lighter shade lip. Yowza. While it can be beautiful for editorial purposes, that is not the look I am trying to achieve now. But that being said, I have been wanting to add a neutral lip liner back into my routine for a bit of a more defined lip and as a base for glosses, balms, etc. I began to do some research and found two that absolutely fit the bill and surprisingly I have gone back to wearing them regularly! 1. 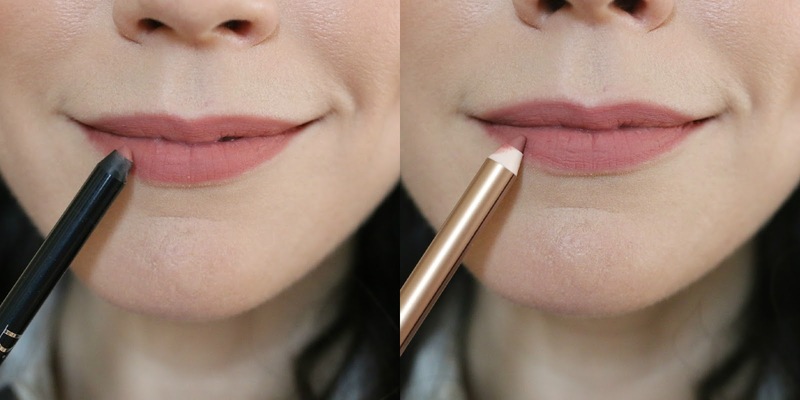 Dior Contour Lipliner Pencil in Grege (left swatch below) - This color is absolutely perfect and while it can give my lips the most perfect definition, it also wears well under sheer colors or more vibrant colors that I want to tone down. The formula is a tad dry so a lip balm is necessary before applying, and touching up throughout the day with a moisturizing lip formula will help keep the lips from drying out too much. But the color is just too beautiful to resist, so it's worth the high maintenance. 2. Charlotte Tilbury Lip Cheat Lip Pencil in Pillowtalk (right swatch above) - Trying to track down this lip pencil was not easy since most of the places I looked were all sold out. Thankfully I managed to because it was definitely worth the wait. The formula is a bit creamier than the Dior and the color skews more pink, but it is stunning when on the lips. Alone, layered or just used around the edge, this lip pencil is a must have in almost every makeup bag. And once it is applied, it does last a very (very, very) long time. After wearing it for a full day, it can make the lips a tad dry, but nothing that a good lip balm (this is an all time favorite) can't fix. Both of these look so lovely! Pillow talk is an amazing lip liner. Have you tried the Makeup Forever Aqua lipliners? The shades are only numbered and can't think of the numbers off the top of my head, but they are pretty much my fave liners ever.